Every year, the Downers Grove Junior Woman's Club recognizes outstanding individuals from the community. Congratulations to 2017 $10,000 Grant Winner - Blessings in a Backpack! The Downers Grove Junior Woman's Club will be awarding a $10,000 grant in support of a local charity project(s). Local non-for-profits throughout Downers Grove and the broader DuPage County area are welcome to apply. The grant application will be available beginning Friday, August 17, 2018. The submission deadline is Friday, September 28, 2108. The $10,000 grant will be awarded at the Downers Grove Junior Woman's Club meeting on Tuesday, November 27, 2018. This contest is open to 7th and 8th Grade students who attend school in District 58, District 66, and other Downers Grove Junior High schools. Any individual artwork such as pencil, ink, painting or sculpture may be submitted and need not be a special piece created for the contest. All entries due by Thursday, January 31, 2019. Awards will be presented at the Downers Grove Junior Woman's Club meeting on Tuesday, February 26, 2019. 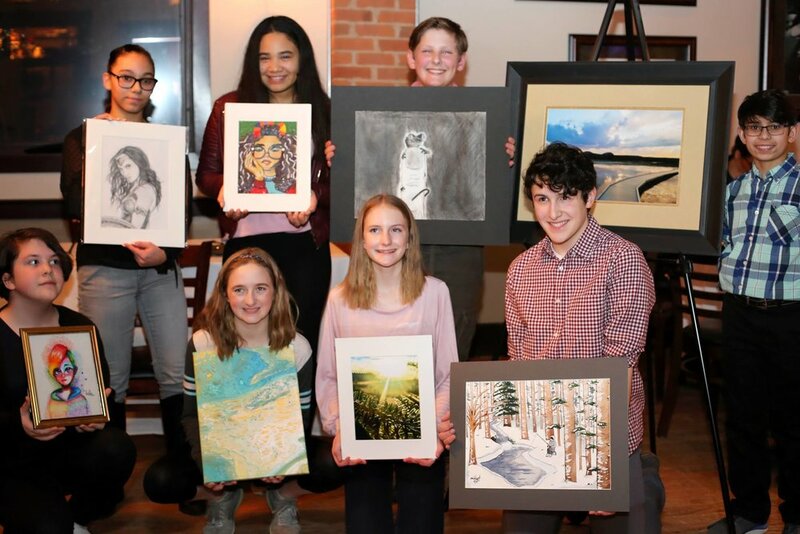 Winning artwork will be displayed in downtown Downers Grove at the Community Bank of Downers Grove and will be returned to the schools in April. Congratulations to outstanding college-bound high school seniors! The Downers Grove Junior Woman's Club will award $2500 scholarships to 4 outstanding college-bound high school seniors. Scholarship winners will be selected based on overall academic excellence coupled with their involvement outside of the classroom. Outside activities may include extra-curricular activities, community service and special projects, recreational activities and hobbies and work experience. Community and service projects are especially important since the mission of the DGJWC is to positively impact the Downers Grove area and the local residents. Applications are due March 31, 2019 and winners will be announced Tuesday, April 23, 2019. Congratulations to the 2018 winning applicants: Tracy Capraro, Caitlin Choinski, Jennifer Gorman, Carli Hochstetter, Christina Gamboa, Jessica Atkins, Bernice Homel and Genevieve Hahn! The Downers Grove Junior Woman's Club is offering a one-time, not to exceed $500 grant to an Illinois School District 58 teacher. The grant is to be used toward a specific program/ workshop/ course or educational supplies in conjunction with a lesson that the educator feels will benefit their students in a creative way. The grant money can be used for personal development or direct classroom materials/programs. Applications are due no later than Monday, April 30, 2018 and the grant will be awarded during Teacher Appreciation Week (May 7-11, 2018).